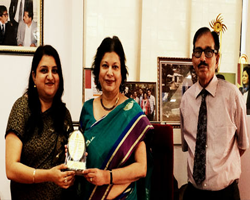 Dr. Daphne Pillai Department of Commerce, University of Mumbai felicitated her for the Research Work in Women Studies on 14th January, 2016 by on the occasion of the 13th International Conference of Commerce and Management held at the Kalina Campus. 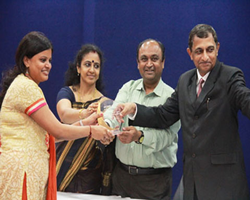 Prof. Kavita Baddi Bagged the Best paper award in the National Conference based on the theme “A Tribute to Dr. A.P.J. Abdul Kalam: India Vision 2020”. It was organized by the Department of Management Studies, Information Technology and Computer Science of our college on September 02, 2015. Prof. Pooja Pandey Bagged Ist prize at Zonal level and got selected for State level Inter- University “Avishkar Research Convention Competition”, December 2015. Prof. Shraddha Kulkarni Bagged the Best paper award in the National Conference based on the theme “A Tribute to Dr. A.P.J. Abdul Kalam: India Vision 2020”. It was organized by the Department of Management Studies, Information Technology and Computer Science of our college on September 02, 2015. Prof. Keekan Priyesh Raghavan Bagged 2nd Prize for a paper presented on the topic ‘A Mesmerizing Soul of Indian Politics: A Tribute to Magnificent Abdul Kalam’ at the National Conference jointly organized by Department of Management and Department of I.T/ C.S., Pillai College of Arts, Commerce & Science, Panvel. Bagged the Ist prize for a paper presented on the topic ‘William Golding’s Lord of the Flies: An Eco-critical Analysis’ at Amity University, Mumbai. Dr. K. M. Srinandhini Devi Presented Poster in Inter-collegiate Avishkar held by University of Mumbai, awarded ﬁrst prize and selected to represent University of Mumbai at the Inter-University AVISHKAR Research festival in Agriculture Category. Mrs. Kumudini Das Selected for participating in 3rd Asian Population Association Conference at Kuala Lumpur, Malaysia and present Oral Presentation on the topic “Incongruence and differentials in reporting death of the child by the couples in India” on 27th & 30th July, 2015. Dr. Daphne Pillai Invited by the Soroptimist International to be one of their international speakers at the panel discussion held in Istanbul, Turkey on 10th July 2015. The topic was ‘Education: the Power of a Second Chance. Headed the International Exchange Program with St. Mary's College of Economics and Business, Moraga, California, USA. This year (2016) nineteen students were selected for a nineteen days program, from 11th February 2016 to 1st March 2016. During this program the students participated in various trainings, workshops and visited industries which gave them opportunities to explore the global market. Received the ASSOCHAM Excellence Award for ‘Successful Entrepreneur in Public-Private Partnership’ awarded to ‘Mahatma Education Society’. This was presented during the Indian Chemical Industry’s National Summit held in New Delhi on 4th December 2015. Dr. Rinkoo Shantnu Chairperson, Peer Review Committee of P.C.A.C.S. Research Journal ‘A Tribute to Dr. A. P. J. Abdul Kalam: India Vision 2020’ Vol.2, September’ 2015, ISBN no. 978-81-926311-0-3 published by Pillai College of Arts, Commerce & Science, New Panvel. Dr. Aarti Sukheja Member, Peer Review Committee of P.C.A.C.S. Research Journal ‘A Tribute to Dr. A. P. J. Abdul Kalam: India Vision 2020’ Vol.2, September’ 2015, ISBN no. 978-81-926311-0-3 published by Pillai College of Arts, Commerce & Science, New Panvel. Prof. Prerna Sharma Appointed as a Chief Editor of PCACS Research Journal “A Tribute to Dr. A. P. J. Abdul Kalam: India Vision 2020” Vol.2, September’ 2015, ISBN no. 978-81-926311-0-3 published by Pillai College of Arts, Commerce & Science, New Panvel. Appointed as a Chief Editor of PCACS Research Journal “Digital India- Road Ahead” Vol.3, December’ 2015, ISBN no. 978-81-926311-0-3 published by Pillai College of Arts, Commerce & Science, New Panvel. Prof. Nithya Varghese Appointed as a Chief Editor of PCACS Research Journal “A Tribute to Dr. A. P. J. Abdul Kalam: India Vision 2020” Vol.2, September’ 2015, ISBN no. 978-81-926311-0-3 published by Pillai College of Arts, Commerce & Science, New Panvel. Invited as a Judge for Inter-collegiate Paper Presentation Competition on “Make in India – Change in Indian Scenario – HRM, Marketing and Finance on 27th January 2016 at KSA Barns College of Arts, Science & Commerce. Dr. Gajanan Wader Appointed as a member of the Peer Review Committee for the P.C.A.C.S. Research Journal- A Tribute to Dr. A.P.J. Abdul Kalam: India Vision 2020, Volume 2, September, 2015 ISBN no. 978-81-926311-0-3 published by Pillai College of Arts, Commerce & Science, New Panvel. Dr. Seema Somani Appointed as a part of the Advisory Committee for National Conference on, “A Tribute to Dr.A.P.J. Abdul Kalam: India Vision 2020” organised by BMS, IT and CS Department, Pillai College of Arts, Commerce and Science, New Panvel on 24th September, 2015. Prof. Deepika Sharma Appointed as Convener of the National Conference on “A Tribute to Dr. A.P.J. Kalam : India Vision 2020”. It was organized by the Department of I.T. & C.S. in association with the Department of Management Studies on September 24, 2015. Appointed as a Chief Editor of PCACS Research Journal “A Tribute to Dr. A. P. J. Abdul Kalam: India Vision 2020” Vol.2, September’ 2015, ISBN no. 978-81-926311-0-3 published by Pillai College of Arts, Commerce & Science, New Panvel. Prof. Gopakumar Pillai Invited to Pillai Institute of Information Technology (PIIT) on 14th August, 2015 as a panel member for conducting interview for the post of Junior Research Fellow (JRF) for a project on“Carbon Nantubes based Nanocomposite Ultrafiltration Membranes for Water Purification”sanctioned by The Board of Research in Nuclear Sciences (BRNS), Department of Atomic Energy. Qualified MH-SET in Life Sciences for lectureship conducted in September 2015. Prof. Bhavana Parab Appointed as Member of Organizing committee of the International Seminar on “Entrepreneurship”. It was organized by the IQAC & Entrepreneur Development Cell in association with St. Mary’s School of Economics, California, U.S.A. on 14th April 2016.